It’s hard to believe, but it was 5 years ago that we launched Vegbooks. The website has grown and flourished thanks to the contributions of our numerous volunteer reviewers, and in the spirit of years past, we’ve come together to share with you our top picks for kids the same age as our website. If you have a kiddo in your life who’s a different age, don’t despair! You can find our favorites for 4-year-olds, 3-year-olds, 2-year-olds, and 1-year-olds by clicking through on the links. And if you want recommendations for another age, please just ask in the comments. First off, two contributors independently nominated Little Ant as the best book for kids this age! Here’s what they had to say. When I used to work with kindergartners (mostly 5-year-olds), one of their favorite titles was Hey, Little Ant, a fun sing-song book about being nice to animals and people. They especially liked having to turn the book around 90 degrees in order to see a giant ant (he takes up both pages). The premise: if the tables were turned, you wouldn’t want to be squished by a giant, would you? So why should humans be mean to animals smaller than us? 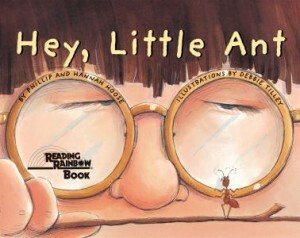 My favorite book for 5yr olds is Hey, Little Ant by Phillip Hoose. 🙂 It’s a great story that encourages kids to think about things they might not have thought about before. It can create a lot of dialogue focused around compassion. A great read for parents, and also teachers! What did everyone else pick? 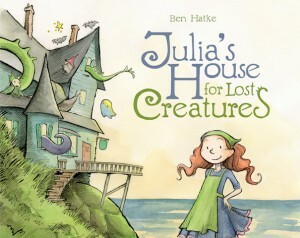 I would say Julia’s House for Lost Creatures and also the Ivy & Bean books. The former is so creative and touching even though it is a picture book and the latter is laugh out loud funny and great for reading aloud at night. For ones they can read to themselves I’d say the Henry and Mudge books are adorable and great for boys and girls. 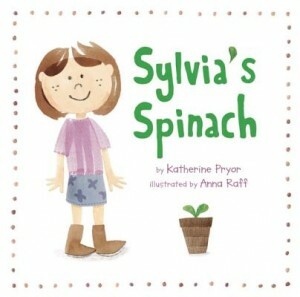 I am choosing Sylvia’s Spinach. Not only is it a cute story about different kinds of veggies but it is also about the growth of a girl who learns that sometimes it is ok when we don’t get exactly what we want in school because something cool comes along anyway! It is also a nice reminder that growing veggies, even in a planter or small container, can sometimes shift a child’s perspective. Just Being Audrey. I chose this book because I love all things Audrey. It is a great way to introduce children to this famous actress and show all the wonderful humanitarian things she did in addition to being a talented beautiful actress. And me? 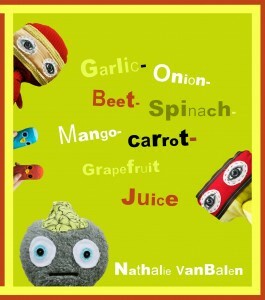 My pick is that hysterically funny and very compassionate book with a super long name: Garlic-Onion-Beet-Spinach-Mango-Carrot-Grapefruit Juice, which is great for older kids too! Tell us about your favorite books for 5-year-old kids, or share a funny story from your kiddo’s 5th birthday, in the comments!